I picked up a great book on eBay, called the "Homestead Album". It was published by the Springfield Homestead, a local weekly newspaper that existed in the late 19th and early 20th century. Unlike the nationally-bent Springfield Republican, The Springfield Homestead focused mostly on local issues, and is a great resource for local research. This book had a lot of photographs of houses in it. Since my house was featured in the May 6, 1899 edition of the Homestead -- a copy no longer available on file at the Connecticut Valley Historical Museum -- I was very hopeful that I would finally find my Holy Grail. But sadly, although my two immediate neighbors' houses were pictured, my house was absent -- so the quest continues. Here is a selection of links to some of the photos in the house -- I will update this list as time goes on. When you click on each photo, it will expand in size. You can then click on "view image information" to get more details about each house, or to leave a comment. 276 Long Hill St. 80 Sumner Ave.
20 Ridgewood Terrace 116 Pearl St. 120 Mill St.
110 Mill St. 278 Long Hill St. 27 Bowdoin St.
70 Bellevue Ave. 128 Mill St. Submitted by bookmdanno on Thu, 02/14/2008 - 04:58. The Homestead did a great article on this house when it was "rebuilt" by Napoleon Russell around 1902 for Lewis Powers of the "Powers Paper Company." Mr Russell basically rebuilt it around the original structure of the 1880's. I'm a great Napoleon Russell fan. I went through The Homestead Magazine from around 1898 to 1910 looking for articles on his work. 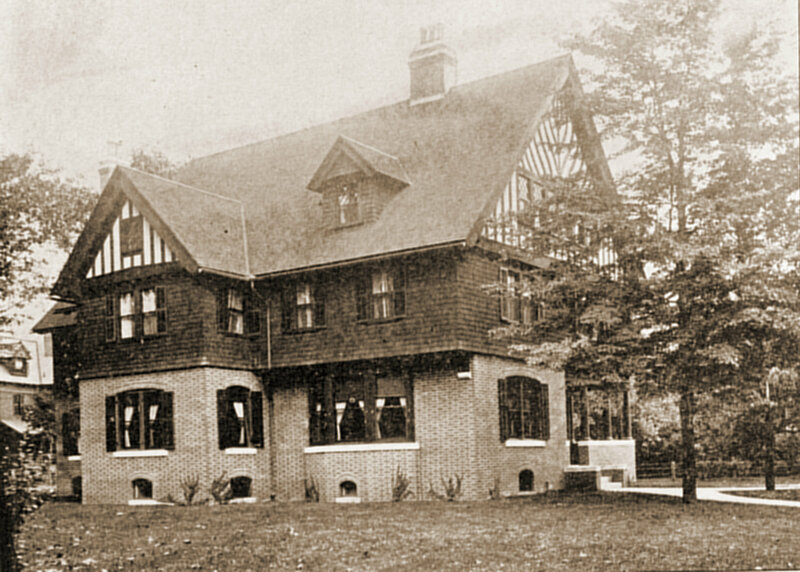 They did a "ton" of articles & pictures of the homes he built including Forest Park, Brightwood, the North End, Atwater Park and Mr George Hendee's mansion in Suffield Conn. Mr Russell also built most of the Indian Motocycle Factory, hence the Hendee estate in Suffield. The barn is the only part of Mr Hendee's estate that is left standing.It is on the National Historic Registry. There is a house at 843 Chestnut St that he built in 1899 for $13000 that is in need of some TLC. I think it was one of his finest that he built. Would love to hear from anybody that has a house built by Napoleon Russell as I think I have the most information about him. Submitted by bookmdanno on Tue, 03/04/2008 - 05:53. I believe there is a picture of F. Roods's house on Chestnut St in the Homestead Photo Album that Ralph has. Both the house at 42 Marengo Park and Rood's house at 700 Chestnut St were built by Napoleon Russell for $9000 each. The house on 42 Marengo Pk was built in 1899 for a Edward Snowman. The house at 700 Chestnut St was built in 1900 for Fred Rood. Both houses are almost identical from the outside. The only difference is the number of columns; Marengo has 6 & Chestnut St has 4. I found a picture in the Homestead from 1902 that showed Mr Rood in his new car in front of his home on Chestnut St. It's not very often that you find a picture of the original owner in front of their home from that era. Submitted by Ben Murphy on Fri, 05/23/2008 - 10:12. Very recently the City of Springfield took 843 Chestnut Street for back taxes. It appears that an older women with mental health problems had lived in the house up until I assume she died about 4 years ago. Yesterday there was a tour of the building that some members of the Springfield Preservation Trust where invited to go on. I took many picture, I hope to get some online soon. While the house is filled with junk and very messy, structurally it seems to be very sound. There is beautiful woodwork and nice inlaid floors. It does need some TLC, but I think much of the work would be cleaning it out and redecorating. I didn't notice in what shape the mechanicals are in and there is some deterioration on some of the exterior details. The house isn't as ornate and over the top as Napoleon Russell's own house on Springfield Street, but definately still a very grand house. After the tour there was some discussion of creating a Napoleon Russell National Historic District in the city. Submitted by Ben Murphy on Thu, 06/05/2008 - 09:41. 843 Chestnut St; Interior Views; Napoleon Russell district yet? Submitted by bookmdanno on Fri, 09/05/2008 - 21:20. USE THE LINK BELOW to see some interior shots sent to me from Judge James Redden from Oregon. His father had a dentist office here from 1938 to 1961. Dr. Redden ran for mayor of Springfield but lost by only a few votes. All but one of the pictures is in color. The color pictures are from the 40's I believe. The black & white picture from 1961 is the only picture of Dr. Redden. His picture is on the mantle in the picture. It's interesting to compare the pictures submitted by Ben Murphy to these older ones. Has anymore been decided on proposing a NAPOLEON RUSSELL district? I have alot of info if it goes thru. Apparently a commission done by the city back in the early 80's had proposed the SAME thing. They stated that the 4 houses on Chestnut St; 832,838,833 & 843 would qualify for the National Historic Register. I think Ed Lonergan was involved in the study. click on link below to see pictures. Submitted by bookmdanno on Mon, 06/09/2008 - 03:58. I used to rent a room at 843 Chestnut St back when I was going to STCC. It has quite a history.There was another tenant there that was a retired Army colonel that told me he thought that Napoleon Russell had built the house.I went to the local history room at the library to look up Russell.I found an article from the Springfield Homestead dated June 24,1899 that showed a picture of the house before the current stone wall was finished. The caption under the picture gave the name: W.H.Bauch. Much to my surprise I found Mr.Bauch's son's phone number and he asked me if the billiard table was still on the 3rd floor. Of course it was gone before I lived there. His dad owned the Bausch Machine Tool Co. down on Birnie Ave back in the 1900's. He said that Henry Ford had stayed in the house when he was helping his dad at the tool company & that Ford sold him a car around 1905-1906. The most 'interesting' owners were the Miranda's from 1928-1932. They ran the bootleg business in Spfld at that time. Mrs. Miranda's 1st husband Carlo Siniscalchi was shot down in 1921. She then married Antonio Miranda & they moved from Wilcox St to 843 Chestnut. Mr Miranda died of gangrene poisoning in 1930. He had the largest funeral in Spfld to date. He had a $7500 bronze casket & $20,000 worth of flowers. A plane hired by Vito Genovese dropped flowers over his grave. Vito Genovese ran one of the FIVE families in NY. Antonio's brother Mike was consigulere for the Genovese family. Mrs Miranda's sister & brother in-law Carlo Sarno lived next door at 833 Chestnut. There supposedly is a tunnel connecting the 2 houses. Mrs Miranda was shot down on Worthington St in 1932. There is a picture of her casket being carried out the front door of 843 Chestnut in the newspaper. The Miranda's put up the iron fence all around the property. The same was done at 833 Chestnut. They also installed the Master bathroom that has imported tiles & fixtures including a 7 jet shower. They hired an italian artist named H.A.Bonfitto that painted murals all around the dining room. I talked to his son & I think he said he had also painted something in Mt. Carmel church. There was a HUGE floor to ceiling gold-leaf mirror with a large marble base that stood in the front hall. I'm not sure if that was put in by the Miranda's or was there from the beginning. The next most interesting owner was Dr James Redden who had his dentist office there. He ran for mayor but lost by only a few votes. His son is a big time federal judge in Oregon. I've talked to the son & he sent me some pictures taken inside the house in the 40's. Most of the pictures are in color which was unheard of back then. Apparently their family was well to do. I hope to get copies of some of the pictures I have on line. I found a great ad in the Homestead from 1911 that used a picture of the house to sell the lot NEXT door at 853 Chestnut. Interestly enough I moved to 25-27 Elliot to be closer to STCC & continue my research on Russell. Submitted by Barbara Shaffer (not verified) on Mon, 06/09/2008 - 12:12. Fascinating story! Thank you for posting this colorful chronicle. Submitted by bookmdanno on Thu, 08/21/2008 - 21:36. The picture from 1899 was used by Napoleon Russell (the architect & builder) for his ad in "Picturesque Views Along the Lines of the Springfield Street Railway", published in 1899. The ad appears on page 182. Ralph Slate has a copy of this book he has used for photos on this website. The picture from 1911 is from an ad that appeared in the Springfield Homestead March 1911. The ad used the house at 843 Chestnut to sell the lot next door at 853 Chestnut. The 1969 shot was from a real estate office selling the house. The picture from 2004 is from the City of Springfield's website. I have more pictures including some interior shots from the 40's that I will load SOON. Below is the link to get to the pictures. Submitted by Ralph Slate on Mon, 08/25/2008 - 16:36. That is a great collection of photos. One question, one of your photos is from the June 1899 edition of the Springfield Homestead. It was clearly a photo of the original paper, not a microfilm. Did you get that photo recently? As I've posted here before, the CT Valley Historical Museum has told me more than once that the May 1899 edition was "lost", and I have to believe that May and June was bound together. Submitted by bookmdanno on Sat, 08/30/2008 - 10:27. Ralph, The picture was taken back in the late 70's by someone recommended to me from a friend at Sears Real Estate. The person used a 35mm camera and also took the 1911 picture & some others for me. The history room had a 'LOOSE' COPY of the page from the Homestead in a folder they found under 'residences' with some other pictures. I'm pretty sure I came across lots of pictures of some homes in Forest Park that were in loose folders. I helped them with some of the pictures as I spent alot of time walking thru neighborhoods looking for homes built by Russell. I don't know if Ed Lonergan still works at the library, but I know he did alot of research for the city. I gave him some information on Russell as I came across it. I spent alot of time going through the ORIGINAL volumes of the Homestead fom 1898 thu 1914. The originals were kept in the basement of the library. Submitted by Anonymous (not verified) on Sat, 11/08/2008 - 00:08. Redevelopment of 843 Chestnut Street is currently being proposed by the City of Springfield . See article & legal notice on Masslive.com dated November 5th & 7th. Also see the City of Springfield website & look under the Purchase Dept. under bid # 198. Springfield Preservation Trust helping to save 843 CHESTNUT St. Submitted by bookmdanno on Wed, 11/26/2008 - 23:02. The Springfield Preservation Trust is helping to promote saving 843 Chestnut St. They have some recent pictures & info on the sale to be held by the City of Springfield on their website. They have a link to my website which has pictures from 1899 to the present. I hope they don't mind that I added their pictures to my website totaling the pictures now to 29. It will help compare the original structure to how it is now. I've given some detail for each picture to give additional information. I notice that the house is currently appraised at $242,900. I wonder how long ago it was appraised. If the taxes were less it might make for a quicker sale based on the current condition of the house. What will happen if the house doesn't sell based on the economy & the time of year??? Submitted by Ben Murphy on Mon, 12/01/2008 - 13:47. It's fine that you posted the pictures of 843 Chestnut Street from the SPT website. Hopefully there are some good plans returned to the city to restore the property to its former glory. Submitted by bookmdanno on Sat, 05/16/2009 - 20:45. The President of the Brightwood Development Corporation; Heriberto Flores; is the new owner of 843 Chestnut St. According to records at the Hampden County Registry of Deeds(available on-line), the cost was $15,500, $500 more than the minimum that the City of Springfield wanted. Mr. Flores is also the owner of 833 Chestnut which shares the driveway with 843 Chestnut. It looks like Mr. Flores did a nice job restoring 833 Chestnut. It would be nice to see 843 Chestnut also brought back to its former 'grandeur'. It would be nice to advocate a 'Napoleon Russell' historic district before any more historic homes are downed by the wrecking ball!!!! Submitted by Ben Murphy on Mon, 05/18/2009 - 09:12. When the city was going through the process to dispose of 843 Chestnut Street, the Springfield Preservation Trust successfully advocated for preservation restrictions on the property, which will protect the exterior from inappropriate alterations. I'm sure Mr. Flores will do a nice job if his current house next door is any indication. The building is already seeing signs of improvement as boards have been removed from some windows, and there is now light in the building at night. I can't wait to see it restored. 843 Chestnut St; Renovations underway, LOOKS GREAT!!! Submitted by bookmdanno on Sat, 08/22/2009 - 20:32. A mutual friend sent me a cell-phone picture taken yesterday of 843 Chestnut St. The last time the house was was white was back in the early 60's when the dentist Dr. Redden lived there. Looks like the renovations have taken great strides. I'm glad to see the current owner is restoring the 3rd floor porch to its original look. You could see the West Springfield Country Club from the 3rd floor porch. It also looks like all the overgrown trees & shrubs were removed from the front of the house. It really makes a proud statement with it new (old) color. Can't wait to see it totally restored. Does anyone know what the current owner has planned to use the house for? Maybe he will move from 833 to this one when it it is complete. 843 Chestnut St. featured in recent house tour. Submitted by bookmdanno on Fri, 06/10/2011 - 21:50. 843 Chestnut St was just featured in Springfield Preservation Trust's Atwater Park House Tour on May 1st. They have a GREAT 7 minute video on Youtube. The current owner has done an awesome job bringing the house back to it's former glory. Kudos to the Trust for saving the house from the wrecking ball. There's a reason Springfield is call the "City of Homes". Below is a link to the Atwater Park House Tour on Youtube. Submitted by Jeff Knowlton (not verified) on Fri, 04/20/2012 - 10:47. 843 Chestnut St. for sale along with 833 Chestnut St. Submitted by bookmdanno on Sat, 08/30/2014 - 21:16. Looks like both 833 & 843 Chestnut St. are for sale. As most of you know both were built at the same time in 1899 by the noted 'Napoleon Russell'. The cost to build 843 was $13,000. The cost for 833 was 'only' $5,000. They share a common driveway. I've written numerous articles on 843 Chestnut on this website. Below is a link to some pictures of 843 Chestnut St. dating back to 1899. Any photos of 833 Chestnut st? Submitted by Heather (not verified) on Mon, 10/20/2014 - 21:04. I saw the wonderful photos of 843 on your flickr account, do you have any from 833 available to view? Submitted by bookmdanno on Tue, 10/21/2014 - 22:06. There are currently pictures of 833 Chestnut on-line as the house is for sale. Current pictures also include interior shots. I have a vey poor photocopy of the article from the Springfield Homestead from June 1899 about some of the houses in the North End of Springfield. There is also a link on THIS webpage which directs you to 'MACRIS'. You'll find a picture of 833 Chestnut on their webpage which includes some history. Research was done back in early 80's. Napoleon Russell built 3 houses like this. 2 are on Chestnut St & 1 is on Marengo Pk. Submitted by Adam Chase (not verified) on Tue, 02/03/2015 - 12:17. My great great grandmother, Nanina (Botta) Mercolino, was with Mrs. Miranda at the time she was shot and killed. I remember this because my aunt Josie, who just recently passed away, told me this story once when i went to visit with her, Mrs. Miranda and my great great grandmother were at a coffee shop i believe, that's what my aunt told me. Submitted by Anonymous (not verified) on Tue, 07/22/2008 - 19:00.
the owner of this home is not deceased. She is very much alive. I find it very disrepectful on your part for divulging any of her personal health information over this site. That shows a lack of class on your part. You also would need some TLC if you had been neglected for years. I suggest next time that you do a little bit more homework and think twice about what you are printing -- as you never know who will read what you are writing. Submitted by Ben Murphy on Wed, 07/23/2008 - 08:42. Sorry that I offended anyone, I was only repeating what I had heard from neighbors. It is my understanding that nobody knows the name of the person who lived in or owned the house. The City of Springfield (which is the current owner of the property) could not locate an owner and there are no names listed on the deed, only a company name. A quick look up on the states corporate database of the name of the company listed as the owner also provides no names. So I am confident that the person in question will stay anonymous. Submitted by Anonymous (not verified) on Wed, 08/10/2011 - 17:19. I am purchasing 33 Marengo Park, does anyone have any information on this house? Thanks very much..! Submitted by Barbara Shaffer (not verified) on Thu, 08/11/2011 - 09:50. A quick look indicates that John G. Spear and Orpha Spear lived at 33 Marengo in the early 20th Century. Mr. Spear and his son, Graham Brown Spear, were inventors who patented improvements in metal working machines and compound pumps. Graham evidently showed great promise as a graduate of the University of Maine. He moved to Washington,DC, where he worked as a designer. Submitted by Anonymous (not verified) on Fri, 09/16/2011 - 21:21. Thank for the information pertaining to 33 Marengo Park. I have purchased the home and am now in the process of restoring it. Lots to do, but I am making things happen. I would appreciate any more informtaion anyone has on 33 Marango Park. I did find out that a woman by the name of Mrs. Rivite lived here for over 50 years. I did find this name in some concrete at the back hatchway. Looks to be written when the hatchway was installed. I understand the the Rivite Family sold the house in 2002 or 2003. Submitted by Barbara Shaffer (not verified) on Sun, 09/18/2011 - 07:19. Have you been to the Registry of Deeds to research the names of past owners? That is the best place to go for starting points. You might even try a simple search on the registry's website. Sellers are in the grantor index and buyers are in the grantee index. Submitted by Margy R Morales (not verified) on Mon, 10/08/2018 - 19:14. Hi I just recently bought a house on Shefford St Atwater neighborhood and I think it was constructed by Napoleon Russell. I would love to talk more about it if you want to. Please feel free to email me any time you want. Submitted by Ralph Slate on Thu, 02/14/2008 - 10:35. I was once very close to finding a copy -- that issue was for sale on eBay. I bought it, only to find out that there were 2 sections to the paper when it was printed, and the copy I bought had only the first section, while the houses were pictured in the second section. In seven years of searching, I have only found 2 or 3 lots of this newspaper for sale. Ironically, one of the sellers was a cousin of mine, an antique dealer who lives in New Hampshire. The CVHM has searched several times for the originals, but they cannot locate them. They must have disappeared recently, because I believe Ed Longergan used them to produce his book on Forest Park Heights -- several of the photos were on the same page that my house was printed on. Did you go through the microfilm at the CVHM? Or is there another source of this newspaper out there? I'd love to eventually digitize all the house photos from that newspaper. Submitted by bookmdanno on Fri, 02/15/2008 - 22:04. I did all my research in the late 70's at the Local History Room at the City Library. I was there so frequently that they let me look at the "original" copies that were stored in their basement. Each year was either in 1 or 2 volumes. It took some convincing to get them to let me go through the originals as the pages were VERY brittle.I started my research when I was a senior at Classical & continued for a couple more years. I worked with Ed Lonergan on most of the work done by Napoleon Russell. Ed had a helper working with him & I think her name was Kathy. The Local History Room(when it was part of the library) used to keep index cards:by address, or by a persons name. Do you know the original owners name? Sometimes the library kept "Homestead" articles in folders by subject. I've seen "loose" Homestead articles about Forest Park while doing my research. Submitted by bookmdanno on Wed, 02/20/2008 - 05:21. I have a microfilm copy of the Homestead from May 20th,1899 that shows your house. Under the picture it has "Cheney Washburn's house on Longhill St." I almost certain it's the same picture you have here. It doesn't show what year it was built. Every year the "Springfield Daily Republican" did a building record around the last week of December. It list each street individually with the owners name & the building cost. I was able to find lots of info from this record. Submitted by bookmdanno on Fri, 02/22/2008 - 22:46. I've found a great website that has an atlas of Springfield circa 1910. It's called "wardmaps.com." The atlas is divided into 26 plates showing the the owners name of EVERY house in Springfield about 1910. I know that the CVHM probably has an original as I used it during the late 70's. You can click on each plate & zoom in on the detail you need. You can zoom in even more by RIGHT clicking on your mouse. Plate #7 shows the house at 270 Longhill St. was owned by Cheney Washburn in 1910. This confirms with the picture in the Homestead dated May 20th 1899. It looks like you can order the maps from the website. I know it would add value to your home come selling time. Submitted by bookmdanno on Fri, 02/15/2008 - 22:50. I was looking at your "Houses of Springfield" website & I have some differing information about the house at 48 Magnolia Terrace. The Scientific American list Louis Newman as the architect. The June 24,1899 edition of the Springfield Homestead lists Napoleon Russell as the builder. The Homestead did a large article on "Rockrimmon" and the George Atwater Estate and included about 3 paragraphs on Mr. Russell. It mentioned that he had built upward of 75 houses including Mr Sadler's house on Magmolia Terrace. The article also had pictures of 833 & 843 Chestnut, also a house on Round Hill built by Mr. Russell. The article also mentioned a house he built on Marengo Park for a Mr. Snowman. The house on Marengo Park is a "mirror image" of the house at both 700 & 833 Chestnut. Mr Russell built 2 houses on Longhill St but only 1 still exist at 155. The other 1 across from 155 was torn down and another is there now. The 1 at 155 was owned by the Dashvesky's. I helped them with an article in the Homestead about their house which included a picture. I got to be good friends with Ellie Dashvesky of Sears Real Estate & she brought me down to Somers Conn. to meet Mr Russell's son George. He was elderly & didn't provide much more information than I already had. Submitted by Ralph Slate on Mon, 02/18/2008 - 23:18. I wonder if there is a distinction between "builder" and "architect"? I've always been curious about Louis F. Newman -- he had such a brief career in Springfield, perhaps just five years -- and then just disappeared. Anyone know anything more about him? Submitted by Brad Martin (not verified) on Tue, 01/26/2010 - 13:10. Do you know where I could find a copy of the Homestead article on Rockrimmon? Submitted by Ben Murphy (not verified) on Sun, 02/17/2008 - 20:43. This conversation is very interesting. This past fall the Springfield Preservation Trust held a house tour in Atwater Park and one of the homes was 193 Springfield Street, which Russell built for himself and lived in until he built and moved around the corner to 50 Shefford Street. 193 Springfield Street is quite impressive inside, I can only imagine what 50 Shefford Street's interior is like. Also, when I worked at CVHM I helped wrap up all the old newspaper volumes in plastic to me moved. They moved all the archives out of the library stacks to make room for the new downstairs spaces in the main library. At that time everything was headed to the Mason Square Library basement. I have no clue what happened to it after SLMA sold the building, maybe it's all still down there. I image they are all still wrapped up with the rest of the archives, somewhere. As far as I know CVHM still has boxes of newspaper clippings in there vertical files at the museum, and still using the old card catalogs (I don't think anything is online). Submitted by bookmdanno on Mon, 02/18/2008 - 01:57. While I was doing my research on Napoleon Russell I got to meet Melinda Phelps & Frank Faulkner of 192 Springfield ST. The Homestead did a FULL page article on Russell's house right after he built it in 1905. They even interviewed him. I contacted Frank Faulkner about the article I had and met with him & his wife at their home. By this time, I had just moved to Vermont in 1980 so they let me stay overnight in their home. The two things that stood out the most from my recollection was the TIFFANY lamp on the first floor & the BIRDS EYE maple woodwork on the 2nd floor. The house had been occupied by Maude Tait the women aviator after Russell moved to Shefford St. I believe she lived there up until The Faulkner's took over. The sandstone wall around the front of the property is much like the wall at 843 Chestnut St. Prior to living on Springfield St., Mr Russell lived at 672 Chestnut St across from the Springfield Hospital. He built many homes on Chestnut & Calhoun streets. He changed his style of work every few years. His 'newer' styles can be found on Pratt,Chapin Terr. & Atwater Park. When I met with his son George, he said that his dad had also built a house around Lake Sunapee in NH, and another house in Gloucester MA. Submitted by Herb M (not verified) on Wed, 02/20/2008 - 13:44. Great pictures. Any from Crescent Hill? Keep up the good work. Submitted by Lauren (not verified) on Thu, 02/21/2008 - 10:57. I live on Parkwood Street, and just recently found out that my street used to be called National Avenue (just east of Continental Ave off of Sumner). I do not know when the street was changed, but do you have anything on any houses on National? Not the most high profile street, developed between 1898-1905 as far as I can tell. Submitted by Ralph Slate on Thu, 02/21/2008 - 23:33. I just wrote this to you in an email, but I thought I'd post it so everyone can read it. You're right in saying that your street used to be known as National Ave -- in fact, a number of other streets in the area were named differently before they were developed. I have a map from 1885 which shows Wilson, Randolph, Jackson, Hamilton, Seward, and Lawrence Avenues -- now known as Spruceland, Firglade, Washington, Forest Park, with Seward and Lawrence never built! I guess that knowing that Parkwood was known as National Ave. gives the name of Continental Avenue a little more perspective. Your neighborhood was originally known as Woodland Park, and at least a couple of houses were built prior to 1900. I have a map from 1899, and it shows houses at #39 (even though the city says 1901), #42, #14, and a house no longer standing at #11 that was across from #14. The city's dating is very unreliable - they had my 1898 house down as a 1920 when I bought it. By 1910 the entire street was developed -- your house was owned by a C.H. Wilcox, according to the city map, but I don't think that was the original owner, because my 1903 city directory does not show anyone by the name Wilcox living on Parkwood. In 1899 your side of the street was shown as being owned by "Kane & Graves", builders from that era, while the opposite side was owned by "Geo. N. Vaughn". J.J. Kane lived in the now-gone house opposite #14. Submitted by Jim (not verified) on Fri, 02/22/2008 - 07:47. Submitted by Lauren (not verified) on Fri, 02/22/2008 - 11:24. If that doesn't work, go to books.google.com and search for the title. Submitted by Ralph Slate on Sat, 02/23/2008 - 23:35. I think that we really need to go on a campaign against vinyl siding. Although such siding is virtually prohibited in historic districts, most houses in other neighborhoods are becoming all-vinyl. While the siding may look pretty good the day it goes up (ignoring the loss of detail to make siding easier), after 10 years it looks really, really crappy, and there's nothing you can do about it. The other problem is that the houses all get sided in white, beige, or yellow, and the trim is always white. So much character is lost in a colorless neighborhood. Drive down Dickinson Street towards Longmeadow and look at the houses that were mostly sided a decade ago. They all look shabby. Someone on Sumner Ave., between Trinity and the X, actually sided a brick house. He did it in the "faux shingle" design, which looks marginally better than the clapboard, but that's just silly. I suppose I can't blame people though -- painters seem to be working themselves out of a job. I have seen more than one neighborhood house painted, and was peeling 2 years later. Many painters do virtually no prep work these days, they just spray the paint on and collect their check. Submitted by TOM TOM (not verified) on Sat, 04/12/2008 - 23:55. Oh I can not agree with you more on the siding issue, they all look stale and such a loss of character and charm, even why they spend serious amounts of money on vinyl that looks somewhat like shakes, but that is just it... it just looks somewhat like it and in the end I call it a "monopoly house" plastic looking. Not to mention I have seen some nice homes sided and when they do end up having a problem it is not noticed until the damage is serious where the sill of the home and four feet up is rotted. I was taught that nothing is maintenance free and nothing last a life time at least the things that are of value. As far as Springfield painters I agree they are "hacks" I have seen the price estimates for Victorian homes in Forest Park and they range from 5,000 to 23,000 for the same home, I re-estimated that same home and came in at 18,000. They do not back brush or roll, they do not use oil primers and some do not even wash the home prior to painting, a good paint job should last at minimum 8-10 years with minimal maintenance if it is done correctly. I am not opposed to spraying only if it used as a vehicle for the primer and paint, it still must be back brushed or rolled at least the primer and first coat. I do most all my work in CT due to the fact I can not compete with these cheap "hacks" and in CT you have to be licensed even to do interior work which helps thin the heard of uninsured and unqualified painters. The only thing worse than vinyl siding is Aluminum siding and Popcorn Ceilings, those must have been invented from the same cheap contractor back in the day. Submitted by TOM TOM on Sun, 04/13/2008 - 00:09. Submitted by Ralph Slate on Sun, 04/13/2008 - 00:16. It's really sad that there are so many hack painters out there. I think they are cutting their own throats -- they do a lousy job, the house peels in 3 years because no prep work is done, and the owner then gets vinyl siding -- one less future customer. My carpenter is actually painting my house, he claims that he hasn't had a paint job peel yet in 20+ years of doing business. Seeing the work he does in preparation, I believe him. I imagine that the prep work must more than double the effort, so it's easy to see why people go with the cheaper options, particularly when the cost difference runs in the "many thousands of dollars" range. No one does the math and says "Hmm, $8,000 every 3 years is worse than $20,000 every 10 years". Submitted by lelisabeth on Sun, 04/13/2008 - 09:07. I think it would probably be restrictively expensive for a whole house, better for the smaller details. Does anyone know of any good painters? I certainly don't want to spend money on someone who isn't going to do it right! I would love my house to be anything but all beige, which is what it is now, but I think I will be doing the patching until I can save the money to do it right! Submitted by Bob G. (not verified) on Sun, 04/13/2008 - 18:20. Sorry Ralph. Hate to be the one...There are plenty of hack contractors out there, but in defense us painters also have to do things that we are told - many clients are only willing to pay so much, and will cut corners and costs where they shouldn't just to be able to say the job got done. People in many cases often take the cheapest bids, and then they suffer the consequences. People who own those giant McKnights, for example, are in for a real expense when it comes to paint jobs - many have been victim to poor work for a long time, so without replacing or totally stripping the wood, there will be continual failure of the painted surface. Period. I could go on and on...Sorry! Submitted by Bob G. (not verified) on Sun, 04/13/2008 - 19:06. I have 20 years in the field as primarily a residential painter in the Greater Springfield area. Much of that work has been in the towns of Longmeadow, E.Longmeadow, and Wilbraham. This whole subject is big for me, as this is my career. I have used most major brands of paint, and have even worked with industrial coatings. I have done quick work, and have also done complex, detailed work that people were willing to pay for. I agree that there are many cheap painters out there, who get a lot of work because they underbid everyone and get the job done fast. This last winter was a tough one for many of us due to the economy and due to low-balled pricing that has seemingly come into the area. The trend in this country has been to expect a lot for a little for a long time, but that doesn't help those of us who are expected to provide it! For homes like a McNight, or most Forest Parks, etc, you should expect a good paint job to be up there in cost, and I'd disagree that most homes will make it 8-10 years before they need new paint - regardless of the prep (unless the siding was replaced) I have yet to see that kind of average, and it's not through a lack of trying! Our company will scrape, sand and prime areas that have failed, but that still won't guarantee that the areas that are intact at the time of the job won't fail - we don't do total strip jobs - the mess and work involved are more than we want to deal with. Caulking is also a much needed product on the outside of a home, but even after all that, water, sunlight, and temperature will still break it down, eventually. Just wanted to say to everyone out there not too saavy about paint - be very wary of the lowest bid - sometimes it's just a hungry guy new to running a business, but often times it's because the painter in wuestion cuts corners and lives by the "quantity vs. quality" creed. I could start my own forum about this and I know Ralph has different intentions here, so if anyone has questions, please email them to me - I'm happy to consult and offer my two cents. I've done a whole lot painting, but in closing I can tell you - there are a thousand ways to skin a cat, and in the end, the cat is skinned. Every painter, builder, etc. has habits and techniques that differ from the next guy, but they may work just as well. The goal is to protect and beautify your home - the definition of that can be different for all of us...! Submitted by Bob G. (not verified) on Sun, 04/13/2008 - 22:29. We have been told by our various paint suppliers that by 2009, they will no longer be able to sell oil-based paints other than what they still have in stock. The issue of phasing out oil paints/stains/etc. has been there since I started painting in the 80's. It seems that they have finally decided to make it a reality. I wasn't able to find a link to anything specifically stating this, so if anyone knows more about please mention what you know about it here? Running a painting business, I can say that disposal of large volumes of paint thinners, oil paint cans, and everything related to it has been a costly problem for a long time. Personally, I can think of two oil painted homes we still do, about every 4 or 5 years. They fade, they yellow, they "alligator"...the oil exterior paint just doesn't seem to hold up well for very long, regardless of how fine a job you do prepping the surfaces...we've experimented with the latex versions of primer and stain for a few years now, and the results aren't so bad so far. But if you have oil and want to convert it to latex, you'll have to first prime with a bonding primer or strip the surface. Latex does not adhere to oil, except in the case of stains - Sherwin Williams has a water-based latex stain product called Woodscapes that we use for almost all of our stain jobs, and from workability to finish to durability, it seems to be an overall superior product for your exterior. Anyway, I think that's enough said from me for now about paint...! Submitted by TOM TOM on Sun, 04/13/2008 - 23:06. From what i understand that they will make slight changes and remarket it, thus still an oil and only as primer and or sell in quarts, I have seen products such as XIM a bonding primer which is one of those acrylic poly blends. I have yet to trust any thing other than penatraing oil for exterior wood. I can tell you from Lennox to Longmeadow for the past 25 plus years most all the trim i have done was satin impervo oil, the closet thing I have seen in a waterbase is from Dulux a ICI company, please do not buy paints from cheap box stores. The cost of matierals is minimal to the labor. Submitted by TOMTOM (not verified) on Fri, 04/25/2008 - 23:59. I finally got a list from ben moore and a list from Sherwin regarding oils that will not be sold in Ma & CT, penatrating oil primers I feel are the best followed by a latex/acrylic paint, I do love Solid stains such as wood scapes, flood and sikkins, I have shyed away from cabot since they went big box store. I know there will no longer be a solid oil stain in any of these companies and as for the very well known Satin Impervo Oil, that will be renamed and carried in the industrial line, some epxoy's will be discontinued also, I have found that the water based hybrid oil solids do not cleen up to well with nice brushes or rollers, I think there is also a special hybrid cleaner for them. The only thing that disapoints me in paints today is they dry so fast... too fast, great for profits if that is what your aim is, but I find myself conditioning the paints with penotrol, flowtrol and other old school ingrediants for penatrating old wood, leveling and no brush marks. I was always taught "when in doubt... Oil it out" in regards to failing issues and primers. You would think... if they wanted to make a REAL difference they would get rid of oil in vehicles first and some day gas, I hope soon at these prices. Submitted by TOMTOM (not verified) on Sat, 04/26/2008 - 00:33. I got the list from ben moore and sherwin williams, Some will not be sold anymore and some with will be re-labeled under industrial lines such as Satin Impervo Oil, The Mostly wide used trim paint. I love stains such as Wood Scapes, Flood and Sikkins, I used Cabot in the past but I tend to shy away from companies that sell out to Bog Box stores, I feel there is a difference in quality or lack of and not only in paints but in major products also such as sanders with same model numbers and yet when torn down the one from the box store and the same one that cost maybe 10-20 more from a local tool supplier has better working guts. Go figure. The only real discontinued product is Solid Oil Stains. Even "Fine Paints of Europe" now has a hybrid oil/latex. I also find that these products do not clean up from brushes, rollers, pans or sprayers well at all and there is a new hybrid cleaner, that I have not tested yet. It leaves a milky residue as if it were oil and those nice brushes loose form. What I find to be the biggest down fall of paints and stains today is they are made to dry so fast and find myself conditioning (Not thining or watering) the paints with flowtrol, penatrol and sometimes old school ingredants to help slow the dry time and promote beautiful leveling with less to no brush strokes and helps stop the caking you get on the upper part of your brush. Submitted by Jim Boone (not verified) on Sat, 02/23/2008 - 07:08. Submitted by lelisabeth on Sat, 02/23/2008 - 16:18. Submitted by Ralph Slate on Sat, 02/23/2008 - 23:29. Jim, is your 1883 atlas the "Walker" atlas? I picked up a few of these plates on eBay last year, I had never seen that one before. Submitted by Jim Boone (not verified) on Sun, 02/24/2008 - 08:03. Submitted by Jim Boone (not verified) on Sun, 02/24/2008 - 12:57. Submitted by Kathy Post (not verified) on Sun, 03/02/2008 - 21:26. Jim, would having some volunteers to work on scanning the WPA pictures help? I might be able to do some, particularly if they let batches of the pictures out for a week at a time. Also, Ralph, I have a copy stand that holds a camera at a set distance, pointing down toward a flat surface. I used to use it to take slides of anatomy atlas pictures to put into my lectures where I teach, pre-digital times. I could show you how it works and loan it to you if you'd like to try it. I would set up clip lights on each side to get even, consistent lighting. Submitted by bookmdanno on Mon, 03/03/2008 - 02:00. During my research on Mr.Russell back in the late 70's, I would a lot of times use the WPA cards at the Building Dept. I found that sometimes the picture would be reversed. On the card for 843 Chestnut St, there are 2 pictures on the card. The picture of the house is reversed while the picture of the garage is correct. If you look closely in the picture, you see they used a small sign with 2 numbers on it that was set on the lawn when they took the picture. The numbers referred to block plan maps for the city. Must be when they used the negative for the picture they didn't notice the picture was reversed. 843 Chestnut St; WPA photos at Building Dept. Submitted by bookmdanno on Fri, 11/28/2008 - 21:52. I'm just noticing that the 2 pictures on the WPA card for 843 Chestnut St. at the Building Dept. look like they were taken at VERY different times. The picture of the house looks like it was taken in the winter with the snow on the ground. The picture of the carriage house(barn) looks like it was taken in the late spring or summer. I have a photocopy of the card and it says the field work was done Nov. 1938. Interesting!!! I have both of these pictures loaded on my website which you can access on the Springfield Preservation Trust website on their 843 info page. If anyone is interested, the Building Dept. also has all the building permits for the house which might help with the restoration process. You might also want to look at the permits for 833 as well as both houses were owned by Miranda & Sarno in the late 20's at the same time. They were sisters. The iron fences on BOTH properties were put in by them. Is the scanning of the WPA cards still in progress or has it been put on hold? Submitted by Ben Murphy on Mon, 12/01/2008 - 13:58. The scanning of the WPA images is on hold while we try and find a volunteer/intern who is available during business hours to scan the images. Some of the streets in the Ridgewood Historic District have been scanned and hopefully will be available online in the next few months. Submitted by Ralph Slate on Mon, 03/03/2008 - 10:50. Where would I be able to purchase such a stand? I'd appreciate a loan too, but I wouldn't mind buying my own, since I think it could come in handy. Submitted by Jim Boone (not verified) on Mon, 03/03/2008 - 07:31. Thanks for the offer on helping with the WPA pics. The preservation Trust has gotten permission to scan the 1939 pictures but it must be done at the building department, they will not let them out of the building. There has been a long history of things disappearing so I understand this, it is such a valuable resource. The Trust does have a portable scanner if this could work for you or some college intern or teenager who is responsible who wants something to do over the summer and the parent could support this do good work. I would suggest you contact Ben Murphy who has been posting on this site and he may be able to give you more information. I hope everyone who frequents this wonderful site are members of the Springfield Preservation Trust. You clearly share their interests, enthusiasm and dedication to Springfield and its built environment. Submitted by Honore Ervin (not verified) on Mon, 03/24/2008 - 11:21. I'd love to work on the WPA photo project...I think my background may be helpful...I have both a BA and MA in Art & Architectural History, and I also worked in the Photographic Images and Archives in the Publications Department at the Carnegie Museum of Art in Pittsburgh for several years. My time is completely flexible, so I could work on the project on site at the Building Dept whenever or for however long is necessary. Submitted by Ben Murphy on Mon, 03/24/2008 - 19:33. It would be great if your available to scan the WPA pictures. Please email me at bmurphy@springfieldpreservationtrust.org and we can discuss the details of the project. Submitted by Ralph Slate on Mon, 03/24/2008 - 22:11. What is the progress on scanning? I have heard, through the grapevine, that the historic districts would be done first. Any feeling as to the percent complete? How will the photos be made available once they are scanned? Can the work-in-progress be accessed now? Submitted by Ben Murphy on Tue, 03/25/2008 - 08:22. I know some photos have been scanned in already. I didn't have anything to do with this first batch, and I don't know how many where done, and unfortunately I haven't had time to investigate. I believe the historic districts will be the first buildings to be done. I believe the photos will be available on springfieldpreservationtrust.org, but because of a busy spring schedule I wouldn't expect anything until the summer at the earliest. I hate to be so vague, but without someone taking the lead on the project it's going to continue to be up in the air. I have quite a bit on my plate and don't have the time right now, but I can always help someone get started on it. Submitted by biology lab report example (not verified) on Sun, 03/31/2019 - 09:55. Submitted by Kathy Post (not verified) on Tue, 03/04/2008 - 23:09. There are several reasonable sources for such a stand, some with brackets for lights and some without. The rootsweb page shows some details on how to use this setup instead of a scanner that gets into some adjustments you can make, if your camera allows it, for light and color balancing. I used to do that with my 35mm and special film but it has been at least 15 years since I fiddled with it and I wasn't all that knowledgeable to begin with. Let me know if you want to take a look at what I have, which I think I got at a tag sale - I'm just a block away from you. You might also check out http://www.piepulscamera.com in Chicopee - they sell used equipment and may have just what you want. Submitted by Kathy_Post on Wed, 04/02/2008 - 19:53. Just typing in springfield as a "keyword in title" search produced 501 cards. I believe there are nearly 5000 cards in the collection, though. As might be expected, many of them are of YMCA's and their camps, all over the world. But if you search for Forest Park, there are a surprising number of cards of the Barney house and mausoleum, views of different parts of the park, and so on. I also came across several cards with beautiful views along Sumner Ave., and there are many many cards of Main St. and of public buildings throughout the city - city hall, churches, schools, libraries, post offices. While some are more recent, many are from the early 1900s. Apparently Cliff Smith travels around and collects these cards at shows and swap meets and then brings more of them to the College each year, so the collection continues to grow. You can also view the cards in person by making an appointment with Paige Roberts, the archivist, at 748-3309 or proberts@spfldcol.edu. Enjoy! Looking for info/photos about 188 Sumner Ave. Submitted by Diana Henry (not verified) on Sun, 04/27/2008 - 09:29. "Of the many handsome residences on Sumner Avenue one that commands much attention is the colonial house of F.W. Lathrop, the real estate dealer. 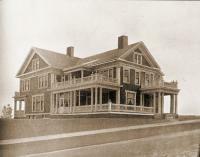 This house was built under the personal supervision of Mr. Lathrop, from plans executed by Carroll H. Pratt of Louis F. Neuman’s office, and was completed a year ago, after being a full year in course of construction. It is of southern colonial design with all the modern details of finish, containing 12 spacious rooms. The large double veranda is surmounted at the third floor by a wide balcony, having entrance to the billiard room. Heavy colonial pillars, four in number, extend two stories in height. From the broad veranda on the lower floor, entrance is made to the vestibule which is finished in quartered oak and oak frieze. The vestibule opens into the spacious main hall, which is really a combination hall and library, there being no division between the rooms. "The library and hall have the massive oak beams at the ceiling, and the side wall are wainscotted in Indian quartered oak. A large fireplace and specially made mantel occupy one side of the library. From the hall the grand staircase, having one-half turn, built of heavy carved oak, ascends to the second floor, with wainscotting at the sides. The reception room is entered both from the vestibule and the main hall and is finished in enameled white wood, rubbed to an egg-shell finish. The ceiling of the reception room is frescoed over canvas and the effect is very pleasing. The dining room is in the old English style, with the heavy ceiling beams and the wainscotting of quartered oak. All of the floors were planed, scraped and sandpapered and then waxed to a high polish. The kitchen, with a spacious pantry and a refrigerator built into the house, completes the arrangement of the lower floor, the laundry being in the basement. The Lathrop House was included on the 1981 brochure for a walking tour of Forest Park Heights, funded by the National Endowment for the Humanities and prepared by the Genealogical/Local History Department of the Springfield City Library “to cover prominent architectural and historical structures that are still standing...” It puts the original cost of construction at $12,000. In 2003 Springfield City Council granted permission to accommodate guests at the Lathrop House B&B, named after the first owner. It is still unconfirmed that the Lathrop House will be on the Springfield Preservation Trust's Forest Park Heights House Tour this May 18th. Submitted by Jim Boone (not verified) on Mon, 12/01/2008 - 14:51. Does any one have any information about this firm, what they built in Springfield etc, especially residential? I know they built Tapley School and possibly 188 Florida St in McKnight as the first owner was Seabury. I am also trying to track down the use of Sandstone in residential houses in McKnight as there are only about 6 of them, all built 1887-1890. 97 Florida,(1887) 205 Florida,(1890) 1154 Worthington,(1889) 147 Westminster (1889), (built by Falt who owned a quarry in E. Longmeadow),1176 Worthington (1890) 80 Cornell (1888). Submitted by David Gaby (not verified) on Mon, 04/25/2011 - 00:05. I have been interested in Richmond & Seabury for years. I still want to do more research, but I think I have gathered a little information. If I am not mistaken, besides the front section of Tapley, and 188 Florida, they built a school in Palmer similar to Tapley, a Memorial Hall in Vernon, Connecticut, that is apparently used as a Town Hall, the old wooden Hope Church at Mason Square, that was replaced with the present brick building, now used by the Shiloh congregation. I also understood that they built the former Nathan Bill house at 284 Maple Street, that was demolished in the '70s, and that either the firm, or Mr. Seabury, designed the Van der Heyden Building on State and Sherman Streets, though it was originally to have been eight stories. If anyone has more information I would appreciate hearing about it, as I'm sure would many others. Submitted by Barbara Shaffer (not verified) on Sat, 04/30/2011 - 09:25. I don't know much about the residential properties, but can add a few non-residential properties to the list. B. Hammett Seabury designed the Forest Park School and Oak St. Primary School. He may have designed a high school for Newport, RI. Francis R. Richmond (who was employed by E. C. Gardner in the late 1870's) designed the Acushnet Ave. School and "surrendered the working tools" for the Masonic Temple at State and Main. He was hired to design the Rockville, CT, high school. Submitted by Barbara Shaffer (not verified) on Sat, 01/10/2009 - 10:24. Submitted by Brad Martin (not verified) on Tue, 01/26/2010 - 13:05. I am interested in any information, particularly photographs of the George Atwater estate called Rockrimmon. I have done a lot of research on the Atwater family and have not been able to come up with a decent photograph. I believe the house was designed by Architect Robert Upjohn. He also designed the Memorial Church (now the Greek Orthadox Church) and Trinity Church in NY. Anything would be appreciated. Submitted by Beverly Fuller Guyer (not verified) on Fri, 01/29/2010 - 16:36. Hello....I lived the first 10 years of my life at Rock Rimmon. I have many, many photos of the exterior of the house and the people who lived there. I have done some research into the Atwater and Weaver families. You probably know that the house burned down around 1957 and I395 goes through where the house once stood. I was able to gather lots of info in Springfield at the Pioneer Valley Historical Society. When I lived there, my grandmother was the cook for Howard Weaver and previously his parents. I lived there with my parents, my sister, my aunt and my grandmother. Annie Stewart was the housekeeper and Ernest Nekitopoulous (sp) also lived there. The Wilsons and Goulets lived in the caretakers cottage. I have many memories of the house, the land and the people. email me if you'd like more info and photos. Submitted by Norm St. Peter (not verified) on Wed, 06/10/2015 - 13:14. You may or may not remember me. But you may be the girl who once told me that you had lived in that house growing up when we met through a very close friend of mine, Jim Taylor. If I'm not mistaken about whom you are, you were married to Jim for a time. The last time I may have seen you and Jim was when, with another mutual friend, Roger Lemoine, we visited you and Jim shortly after you were married at your home in CT. I was very saddened when I heard of his passing. I found your post when I was looking for pictures of the house, carriage house and grounds to show to my children and grandchildren. After recounting to them my many adventures there with my childhood friends after it had been abondened, they, of course, wanted to see pictures - so I went on a hunt to find some. I was so excited to find a post from YOU, and look forward to hearing from you and to hear how you have been over these years. Submitted by Anonymous (not verified) on Wed, 12/13/2017 - 00:30. Submitted by jimboone on Sat, 01/30/2010 - 08:07. Submitted by Brad Martin (not verified) on Tue, 09/21/2010 - 21:58. Did you ever see pictures of Rockrimmon from Bev Guyer? Submitted by Brian sheehy (not verified) on Tue, 03/30/2010 - 16:01. We at the Atwater Civic Association have recently updated our webpage and are looking for photos and information which are relevant to the history of our neighborhood. We'd be absolutely thrilled to see any of the photos you mention. Perhaps we could even post a few on our site. We would also love to hear about your childhood experience at Rock Rimmon. First hand accounts of vanished places are in the end, as ephemeral as the places themselves. Maybe by recording and sharing some of your memories, we can foster and preserve a knowledge of our neighborhood's past; a knowledge which will help residents more fully appreciate the uniqueness and value of the place they call home. If you'd be interested in meeting with one or two members of the Steering Committee, please write to me at bsheehy85@comcast.net. Submitted by Anonymous (not verified) on Wed, 03/31/2010 - 10:44. What is the address for your website? Submitted by Brian Sheehy (not verified) on Thu, 04/01/2010 - 09:21. Submitted by France (not verified) on Sat, 04/10/2010 - 20:17. I grew up in that house from 1963 until it burned, i have no pictures of it but do remember there was a article in a Springfiled paper in 1905 about the house being built. have you heard of the article would love to get a copy of the paper. Submitted by Ben Murphy on Tue, 04/13/2010 - 13:31. The Springfield Preservation Trust has finally gotten some of the WPA images online, and 104 Mulberry Street is one of them. You can find them at springfieldpreservationtrust.org under the resources tab. Submitted by Mike (not verified) on Sun, 11/13/2011 - 20:58. I was hoping to get some more information and possibly photos of my home on Parkwood Street. Does anyone have any suggestions on where I could get more information? Submitted by Jim Boone (not verified) on Mon, 11/14/2011 - 08:42. What is your address on Parkwood as I have at least one old Post Card of a house there. Also, the building dept at 70 Tapley St has a photo of every house taken in 1939 that you can get a copy of. Submitted by mike (not verified) on Mon, 11/14/2011 - 09:19. Submitted by Damaris (not verified) on Sun, 01/29/2017 - 15:42. I wish I had discovered this site years earlier. Maybe if anyone who still searches through here will be able to help me out. I grew up In Springfield on Calhoun St. Ive been doing some research on and off over the years hoping to find a photo of the home I grew up in. The house is 108 Calhoun st. its a queen anne style home that was built in 1894. Like the house next door I believe it was built by Napoleon Russell as both house's have identical emblems carved into the façade of the house. The home used to have a wrap around porch but as my father bought the home in the early 90's it was already gone. I'm hoping to find a picture of what the house used to look like when it was first built or a photo of it before the 1950's. I was told a photo of it does exist but I have never been able to find it. Submitted by Judy (not verified) on Wed, 07/25/2018 - 20:20. While working on my family tree I find that my 6th Cousin 4 times removed lived at 85 Atwater Terrace, Springfield, MA in 1900. I was looking for a picture of the house (the house that is there now is newer). He was listed on the 1900 census as a land owner so I am assuming that he was a man of some means. Any info would be greatly appreciated. Thank you.